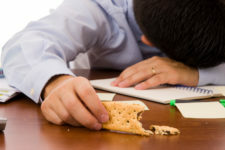 Are Your Meetings a Snoozefest? What is the difference between a newsletter and a meeting? You think this is a trick question? It’s obvious, right? Apparently not so obvious to a lot of leaders. Like a memo or newsletter, many meetings end up as simply a way to disseminate information. Those attending go around the horn and update the others in the room about what’s going on in their respective areas of responsibility. Or maybe during the meeting someone “trains” you on a new procedure, product, or service. Thus, many meetings are simply newsletters in disguise. If you are gathering others in a room or in a virtual meeting space to merely disseminate information, send a newsletter or memo instead. In contrast, you should use a meeting format when there is a topic to discuss that is critical to the long-and short-term success of your organization. As proposed in Patrick Lencioni’s Death by Meeting, every good meeting needs “conflict” . . . something that will spark all kinds of thought, discussion and disagreement, allow enough time to discuss the issue(s), and not mix administrative, tactical and strategic topics. 1. To check-in daily with those working with you. This is a short 5-10 minute administrative meeting where a supervisor and her direct reports briefly huddle to exchange information regarding their top priorities of the day. It allows for quick updates, coordination and coverage if needed. 2. To report back on the progress of tactics that are being implemented and are based upon the goals generated during a strategy session. This is a weekly meeting where an entire team meets to report on individual efforts to impact team and organization goals and to make new commitments for the coming week. In addition to Lencioni’s book, I recommend The Four Disciplines of Execution by Chris Chesney, Sean Covey, and Jim Huling for a practical structure to these types of meetings. 3. To discuss the current strategy related to the organization’s current business goals and the progress being made. These can be held monthly or as needed and usually last from 2-4 hours. 4. To do more in-depth organizational planning, including to review strategy, industry trends, strengths, weaknesses, opportunities, and threats. This can be a two- to three-day meeting held offsite and may include department heads and other senior leaders, who gather to brainstorm, analyze, prioritize, and discuss where the business is going with respect to its market, products, service, or structure. Sometimes they also discuss internal talent and succession planning. All of these meeting types require the participation of the attendees around a meaningful topic. So reflect on the meetings you convene or attend. If you lead the meetings, what can you do make them more engaging for the others in the room? What topics, central to your organization, need to be discussed more and would lend themselves to lively discussion and analysis? Assuming little or no discussion is required, what straightforward information currently shared at your meetings can be shared in a way that doesn’t take meeting time? 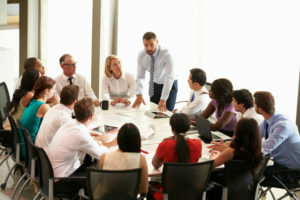 In short, instead of holding a meeting where others are dragging in a few minutes late, dreading the time they will have to spend listening to the same old irrelevant information and hoping there will be someone else in the room they can text with under the table, what can you do to your meetings, so others can’t wait to come and participate . . . ?